Each Suzaku proposal must include at a minimum the source coordinates, exposure time, instrument configuration and expected count rates, and any observing constraints within the four page limit. The review panels will base their decision primarily upon the justification of the proposed science to be done with the data. This chapter describes how to prepare a strong proposal, including the various software tools available to assist the proposer. One of the first tasks in preparing a proposal is determining when and for how long a target can be observed as there is very little use to simulate a source that cannot be observed. This can be easily done with Viewing, a simple Web-based interactive tool (see Appendix C) that can determine visibility for many different satellites. To use Viewing, simply enter the target name or coordinates, and select the satellite. Viewing will return all the available dates when that target is observable. Another initial check to be performed before starting sophisticated simulations it to ensure that the target has not yet been observed by Suzaku. At the time of the writing of this document, the observation database is not available via Browse but users can check the different target lists. The SWG target is available in Appendix B or on line at . The calibration is available at while the list of accepted AO1 targets is at 1Users should also check the observations log located at as some of the targets (category C) may have been accepted but not observed. While it is conceivable that one would wish to study a previously unknown X-ray source with Suzaku, a more likely scenario would involve a spectroscopic study of an object with known X-ray flux. A viable proposal should state the scientific objective of the observation and show that Suzaku can achieve this objective. Observations that require one or more of Suzaku's unique capabilities would be especially strong canditates. Every Suzaku proposal must have an estimate of the expected source count rates from the proposed target for all detectors. This rate is used both by the reviewers to evaluate the viability of the proposal and the operations team to evaluate any safety concerns. The simplest tool to use in estimating the expected XIS or HXD count rate is PIMMS. This tool is freely available as a stand-alone tool or on the Web as WebPIMMS (see Appendix C). The next level of detail is provided via simulations using XSPEC, and such simulations should provide significant insight into the expected spectrum obtained from a proposed observation. A brief guide to XSPEC simulations is given in § 4.4. In many case, this should be sufficient for a point source. There are also tools available to simulate imaging data, which may be useful for an extended source or a particularly bright source. In particular, the most powerful tool is xissim, which can use a FITS format image with an assumed spectral shape of the source to estimate the distribution of events in all elements of the XIS detectors. This tool is an interactive, menu-driven program, which has an extensive HELP facility. It is also available as the web-based tool WebPIMMS. In either case, users specify the flux and spectral model with its parameters, and PIMMS/WebPIMMS returns the predicted counting rate. PIMMS/WebPIMMS can be used for a variety of other instruments, so if for instance the counting rate and spectrum of a given source observed with the ROSAT PSPC is known, it can calculate the flux, which in turn can be used as input to estimate the expected counting rates. The limitations of the input source must be considered carefully. For example, ROSAT had no significant response to X-rays above keV, and so is not useful when estimating the HXD GSO count rate. Perhaps the easiest tool for simulating X-ray spectra is the XSPEC program (a part of the XANADU software package), which is designed to run on a variety of computer platforms and operating systems and is freely distributed on the NASA GSFC HEASARC Website (see Appendix C). The simulation of an XIS or HXD observation requires the current instrument redistribution matrix (the so-called .rmf file) and the energy-dependent effective area of the instrument (the so-called .arf file), both available on the Web or via anonymous FTP (see Appendix C). The procedure for simulations is relatively simple: if the XSPEC program is installed, one should start XSPEC making sure that the proper .rmf and .arf files are accessible. Within XSPEC, one should specify the spectral model, such as hot thermal plasma or the like (via the model command). Specifying the model will drive XSPEC to query for the model parameters (such as temperature and abundances for an APEC collisional plasma model), as well as normalization. The key command to create a simulated spectrum is the fakeit command, which will query for the redistribution response (the .rmf file), and the ancillary response (the .arf file) or in the case of the HXD for response matrices (.rsp files). The fakeit command also will request the simulated data filename, and the length of simulated observation. One can now use this file within XSPEC to determine the sensitivity of the simulated data file to changes in the model parameters. Users should adjust the normalization of their input models to reflect the actual count rate or flux (absorbed or unabsorbed) of their source. Some of the features of XSPEC are also available as a web-based tool on the HEASARC website (see Appendix C). WebSPEC calls XSPEC behind the scenes, so all the issues described above apply here as well. After selecting the instrument, WebSPEC allows the user to choose the spectral model, such as an absorbed collisional plasma or a power-law spectrum with an absorption component. 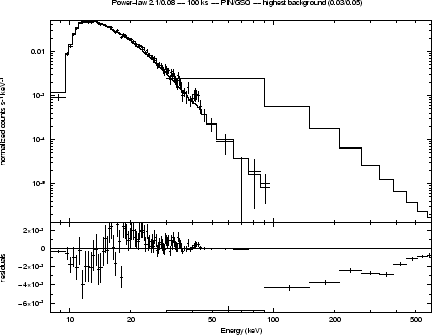 The next page will then query for the model parameters (such as temperature and abundances for an APEC collisional plasma model), as well as normalization, exposure, upper and lower energies, and the number of bins to use in the spectral plot. WebSPEC will then create a simulated spectrum after clicking the ``Show me the Spectrum'' button, using the fakeit command. This folds the specified model through the instrument response and effective area, calculating the observed count rate and fluxes as well. WebSPEC will then allow one to download the postscript file of the spectrum, change the model parameters, or replot the data. To show how to estimate the proper exposure, we include some simple examples of XIS and HXD observations that illustrate the process. The Local Hot Bubble is the proposed origin for at least some of the 1/4 keV emission seen in the ROSAT All-Sky Survey at all latitudes. Although Suzaku has some sensitivity at 1/4 keV, a more profitable approach to finding this emission is to detect the OVII emission that should accompany it. In this case we need to calculate the expected count rate from the OVII and compare it to the expected background. We first need the expected flux, based on published papers or the PI's model. In this case, we expect the surface brightness to be 0.34 ph/cm /s/sr, based on a number of papers. Since the XIS field of view is , this value corresponds to a total surface brightness in one XIS of ph/cm /s. The next question is the effective area of the XIS instruments at the line energy. OVII is in fact a complex of lines, centered around 0.57 keV. Examining the effective area plots for the XIS in Chapter 2, we see that the effective area at 0.57 keV in the BI CCD is cm ; for the FI CCDs it is cm . The curves shown on Fig do not include the contamination effect. The computation below is only given as an example. Please note that the more current effective area curves for the FI and BI CCDs can also be found by loading their responses into XSPEC and using the plot efficiency command. Warning: The XIS .rmf response matrices are not normalized, and so must be combined with the .arf files to determine the total effective area. With the expected flux and the effective area, we can now determine the expected count rate in the BI and FI CCDs to be 1.3 and 0.87 cts/ks. This is obviously a extremely low count rate and so the expected background is very important. The resolution of the XIS is quite good, as shown in Chapter 6, at 0.57 keV a bin of width 60 eV will contain most of the emission. The XIS background rate (see §6.8) at this energy is only 0.05 cts/s/keV in both the FI and BI detectors, so we can expect a background of 3 cts/ks. In both the FI and BI detectors the line will be below the background, but this does not intrinsically hinder detection. As will be seen below, in the HXD this is the norm rather than the exception. One aid for this observation is that the OVII line is relatively isolated in this energy range, with the exception of the nearby OVIII line. Assume we wish to detect the OVII feature with significance. 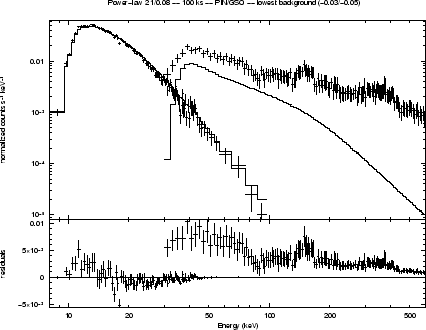 Then the total count rate in the XIS-S1 (the BI CCD) in our energy band will be 4.3 cts/ks, with 3 cts/ks of background. In an N ks observation, we will measure the signal to be . To achieve a result, then, we need , or ks. Another common observation will be to search for faint hard X-ray tails from sources such as X-ray binaries. We describe here how to simulate such an observation, including the all-important HXD background systematics, which will dominate all such observations. The first step is to download the latest versions of the background template files and the response files from the website listed in Appendix C. The HXD website will also describe the current best value for the systematic error in background estimation. For this AO, proposers should carefully read Chap.7 and evaluate the systematic errors for the PIN and the GSO backgrounds in the energy band of interest, and at the exposure level chosen and not just "use a number". For example, with 100 ks exposure, the value for PIN in the 15-40 keV band is 3%, and that for the GSO in the 50-100 keV is 3%. Since these energy bands are important in this case, the associated errors should be first estimated and then, used in the procedure described below. In addition, the proposer should also check if contaminating sources exist in the FOV of the HXD, using existing hard X-ray source catalogs from satellite such as RXTE-ASM, INTEGRAL, and Swift, before beginning this process. We set up XSPEC to use these by reading the background template files as both data and background along with the response files. and are not suitable for fit. ***Warning: Detected response matrix energy bin value = 0 (or neg). XSPEC will instead use small finite value (response file will not be altered). Chi-Squared =       164109.3 using 768 PHA bins. Valid fit does not exist. Now we can create fake PIN and GSO data with the ``fakeit'' command. The result will be simulated spectral files which include the instrumental background, effective area, and resolution. gso_10mCrab_100ks.fak. Now we fit these datasets with the same Crab-like model. We will use three different background spectral models-low, medium, and high-which vary by as much as 3% for the PIN and 5% for the GSO. This takes into account the fact that the ``true'' background will likely vary within these limits. One item of note is that we do not use the ``faked'' background files afterwards which were also created by the fakeit command. That process assumes that the background is obtained together with the actual observation, e.g. using the outer region of the CCD image. In an HXD observation, this is not the case. The background is generated by modeling from the database, and users should use the template background throughout the simulation and also the future analysis. We load the background files twice, once as background and once as a correction file (``corfile'') which will allow us to easily vary the total background within XSPEC. Chi-Squared =         402.11 using 768 PHA bins. Chi-Squared =       820773.2 using 768 PHA bins. All the necessary data files are now loaded, and we now experiment with different background levels, set by the value of ``cornorm''. A value of 0 gives the ``normal'' background, for example, and 0.05 increases it by 5%. Chi-Squared =         372.97 using 519 PHA bins. Chi-Squared =         371.02 using 519 PHA bins. This result in the plot shown in 4.1. Figure 4.1: First simulation with cornorm of the two background files put to 0. Now we check that the same source signal would be detectable with a high background taken to be 3% for the PIN and 5% for the GSO. Chi-Squared =        2241.79 using 519 PHA bins. Chi-Squared =        2108.08 using 519 PHA bins. This result in the plot shown in Fig.4.2, and it clear from that figure that the signal is undetectable at all in the GSO band. Figure 4.2: Simulation with the highest possible background for both PIN and GSO. Finally, we check the source signal using low backgrounds. Chi-Squared =        2554.67 using 519 PHA bins. Chi-Squared =        1990.30 using 519 PHA bins. 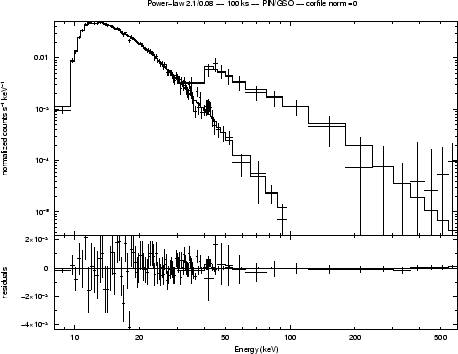 The result in the plot shown in 4.3 where now the GSO spectrum is largely above background. Figure 4.3: Simulation with the lowest possible background for both PIN and GSO. By comparing the different fit results from these different runs, the total expected error in the slope and normalization can be estimated. xissim is a Suzaku XIS event simulator, based on the tool xrssim. It reads a FITS format photon list file, traces photon paths in the telescope (via ray-tracing), and outputs a simulated XIS event file. XRT thermal shield transmission and XIS detection efficiency are taken into account if requested. Each record of the photon list file describes the celestial positions, arrival time, and energy of the input photon. The mkphlist ftool can create such photon list files from FITS images (e.g., ROSAT HRI or Chandra images) and spectral models (which may be created in XSPEC). The xissim output event file may be analyzed just like a real data, using standard analysis tools such as xselect. MAKI is another Web-based interactive tool (see Appendix C) that can determine the orientation of the XIS CCDs on the sky as a function of the observation epoch within the visibility window of the target. For Suzaku, the orientation of the solar panels with respect to the spacecraft is fixed, and at the same time, the range of the angles between the vector normal to the solar panels and the vector pointing to the Sun is restricted, which in turn restricts the roll angle of the spacecraft. When using the tool, general instructions are available via the ``Help'' button. section. To check the visibility and available roll angles for a target, first load an image. This can be done with either an existing FITS image, or by entering the RA and Declination of the source and clicking the ``New Graph'' button. This creates an image upon which the Suzaku XIS field of view (FOV) will be shown. The ``Mission and Roll Selector'' (in the upper right of the display) allows different instruments from different missions to be selected. Then the FOV will appear on your image. This can be rotated using the ``Roll angle'' slider bar. RPS, or the Remote Proposal Submission tool, must be used to enter the basic proposal data into the ISAS/JAXA, HEASARC, or ESA database. Proposers should make sure they use the appropriate RPS, since they are multiple reviews. See Appendix C for the list of RPS websites and addresses. Two versions of RPS are available: a character-oriented version, where the user submits all the required information via e-mail, or a Web-oriented version. One aspect of RPS that is not immediately obvious is how to specify the time-constrained observations. For instance, a need for such an observation may arise for a study of a spectrum of a binary system in a particular orbital phase. If some particular aspect of the observation cannot be clearly specified in the RPS form, the user should detail it in the ``comments'' field of the RPS form and/or contact either the Suzaku team at ISAS/JAXA or the NASA Suzaku GOF before submitting. The PI is responsible for supplying the correct J2000 coordinates. For extended sources, specify single FOVs (coordinates for the center of XIS or the HXD) or rastering parameters (a schematic drawing overlaid on images would be the least ambiguous; equivalent textual descriptions are acceptable). Explain how they were calculated (for a highly variable source, added explanation -- such as ``excluding any bursts'' -- would be helpful). If the source is not expected to be a hard X-ray source, this can be set to 0.0 since only the source counts are to be included. The HXD and XIS aimpoints differ by 3.5 . To get the full effective area for a given instrument, the instrument-specific aimpoint must be chosen (the HXD aimpoint is at (DETX,DETY)=(-3.5 , 0) on the XIS image). The reduction in effective area for the non-selected instrument is %. The current recommendation is to apply "the charge injection" (CI) option. The simulation tools and response files provided for AO-2 proposers assume CI, with a better spectral resolution compared to the non-CI case. However, the CI option may not be usable with some combinations of the window and burst options. Compatible combinations of the options are found in the Suzaku web page. Proposers requesting observations of bright sources that require window and burst options should consider the consequences, should CI be unavailable for the observation mode, and watch out for possible updates from the XIS team. These include monitoring, coordinated, phase-dependent, and roll-dependent; TOOs are allowed, but the triggering criteria and the probability of triggering must be spelled out in text, and summarized in target remarks. Note that the GOs are welcome to propose for targets already approved for the SWG or AO1 time (see the Announcement of Opportunity). However, in the interest of maximizing the scientific return from Suzaku, the proposal must explain why the already-approved observation does not meet their scientific objectives. Valid reasons include a much longer exposure time; incompatible time constraints; different positions within an extended source. We note also that the XISs are also subject to count rate limitations, because of possible multiple events in an XIS pixel within one frame (see § 6.9.1). This is much less of a problem than with the ACIS aboard Chandra, as Chandra's mirror focuses the X-ray flux into a region of a CCD that is orders of magnitude smaller. The rule of thumb is that the XIS can tolerate a point source with a count rate up to cts s per CCD with essentially no loss of counts or resolution. For brighter sources, these limitations can be reduced via a variety of XIS modes, such as the use of a sub-array of the XIS, as discussed in § 6.5. Finally, it is important to remember that because HXD is a non-imaging detector, contaminating sources in the field of view can significantly affect your results. The HXD field of view is defined by a collimator with a square opening. The FWHM of the field of view is below keV and above keV. Considering that twice the FWHM value is required to completely eliminate the contamination in a collimator-type detector, and the source may happen to be located at the diagonal of the square, nearby bright sources within a radius of and from the aim point can contaminate the data in the energy band below and above keV, respectively. If you specify the roll-angle to avoid the source, the limit will be reduced to and , respectively. It is the proposer's responsibility to show that any source with a flux level comparable to or brighter than that of your interest does not exist within these ranges. The proposer can check this in the minimum level by using the hard X-ray source catalogs from such satellites as RXTE-ASM, INTEGRAL, and Swift amongst others. Proposals to NASA must be submitted through AKBAR/RPS. The user interface of AKBAR/RPS is similar to that of "classic" RPS except that the PI must first create an AKBAR account and/or join the Suzaku RPS group. Having done so, the Suzaku RPS form can be accessed via AKBAR/RPS. The estimated level of effort (in FTEs) of any NASA civil servants among the team (PI or co-Is) must be entered into the AKBAR/RPS form. Enter 0 if no NASA civil servant is part of the team.